It feels like we are checking off “Wedding Wednesdays” left and right. Time seems to be flying, y’all, and I am too excited about it! 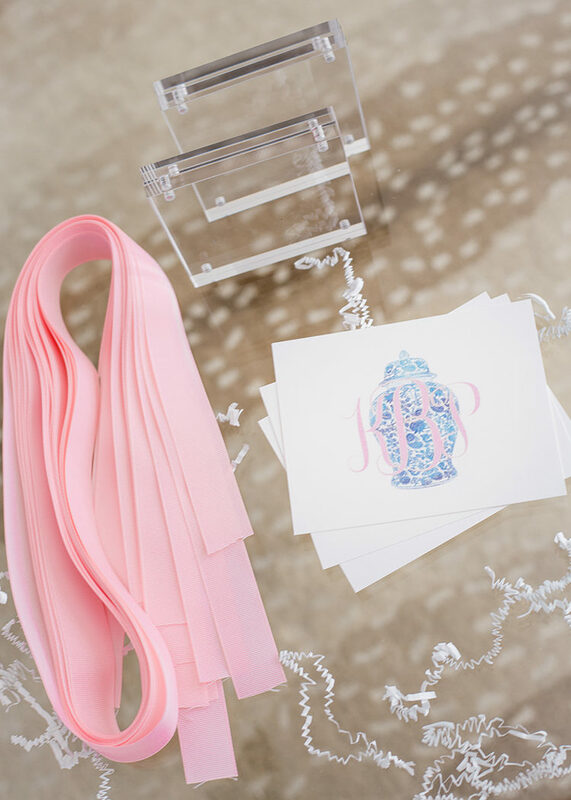 Today, I’m sharing a highly requested post… how I asked my bridesmaids! Can I be honest with you? Early on, I simply called them. I know, I know. So not trendy. But to be honest, in the midst of the craziness of those first few months of planning, finding a cute way to “propose” never seemed to be the most pressing matter at hand. Suddenly, I looked up and realized it was high time my girls at least know they’re in my wedding. Let me tell you, the good old fashioned way worked just fine. I did want to do something special to honor these ladies, though, so once the dust settled on the planning landscape I decided to put a little something together! My priorities? A gift that was simple, meaningful, non-junky and something that tied in with the theme of our wedding. 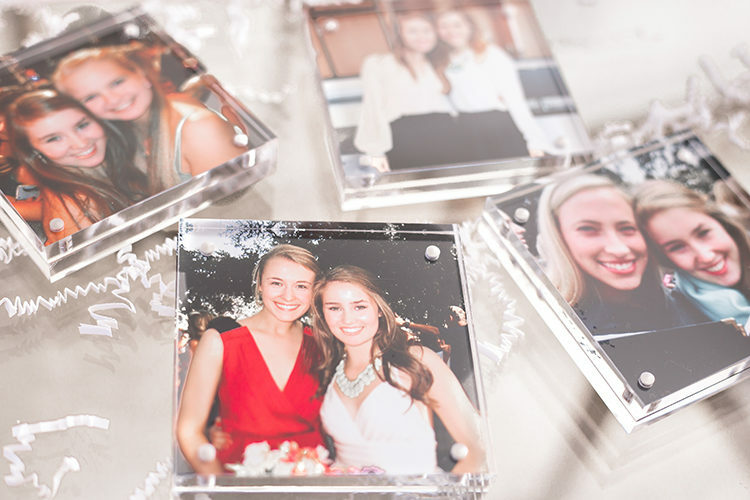 A few Amazon orders and intensive Facebook stalking session later (you’ll see what I mean below), I’m so happy with how these “bridesmaid proposal gifts” turned out! 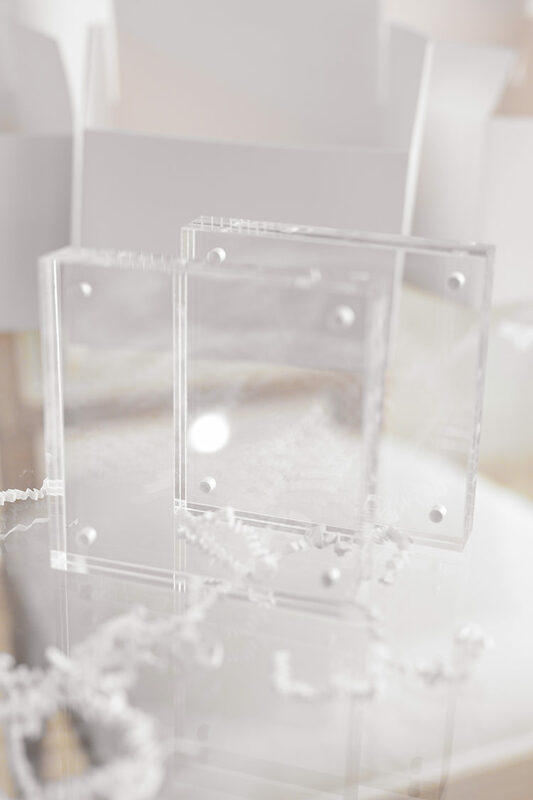 Take a look at the process of putting these gifts together, and read on for the details! In thinking about meaningful gifts that stand the test of time, two things immediately came to mind. A handwritten note (my favorite thing!) and a framed photo! The second component of the “proposal” box? A framed photo. 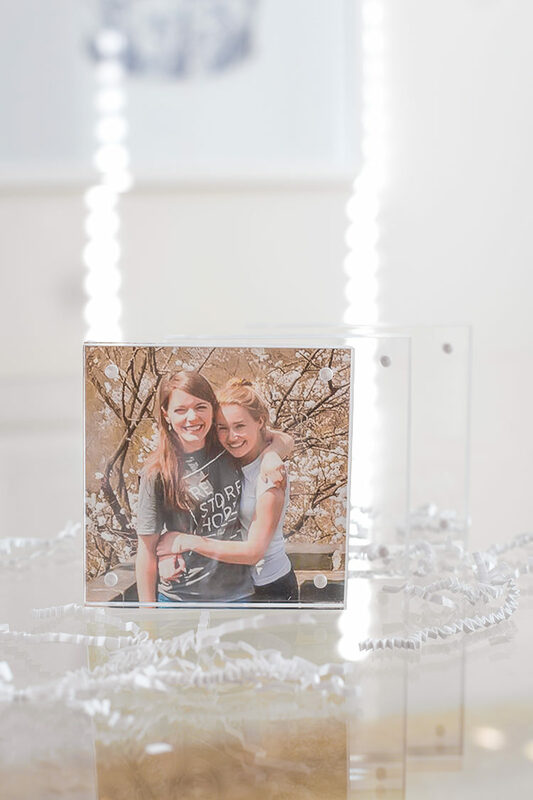 I found these 4″x4″ acrylic frames on Amazon, and immediately loved them for their price point and neutrality. Here’s the fun part: I decided to hunt down the first photo (or one of the first) that I could find together with each of my bridesmaids to fill them with! This was such a fun, hilarious and sentimental step, and I think my girls are going to die when they see them. 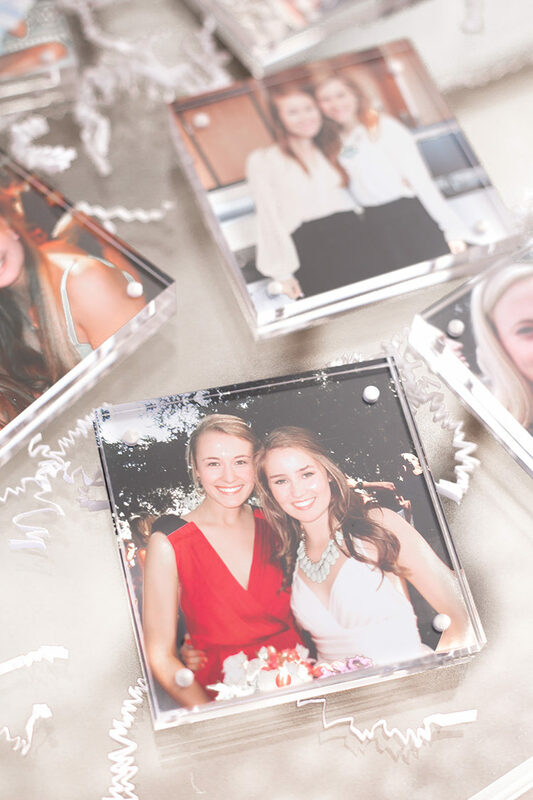 Once we get photos back from the wedding, I plan on sending a square image of me with each bridesmaid for them to put in the other side of the frame! 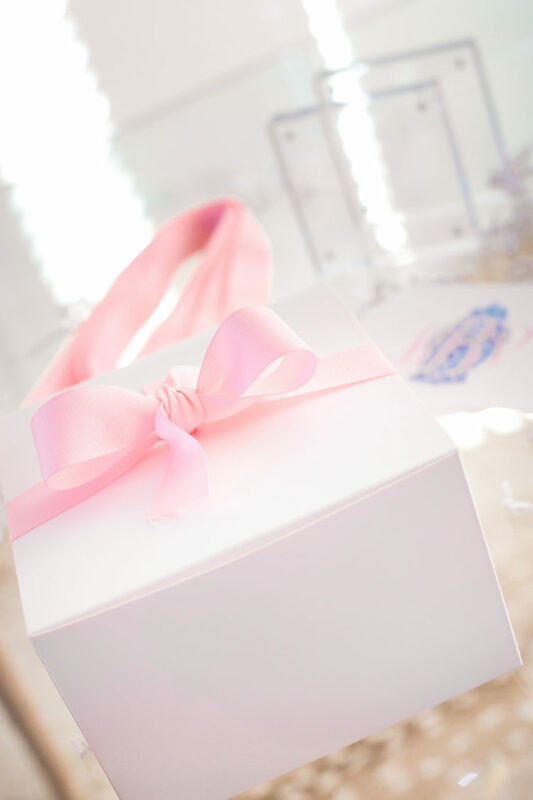 To pack everything up, I filled these white gift boxes with a little crinkle paper, tied it off with a bow (pink, of course) and delivered/shipped off these little goodies to each of my bridesmaids! I love knowing they’ll not only have something to get excited about, but something to have even after the wedding is done. 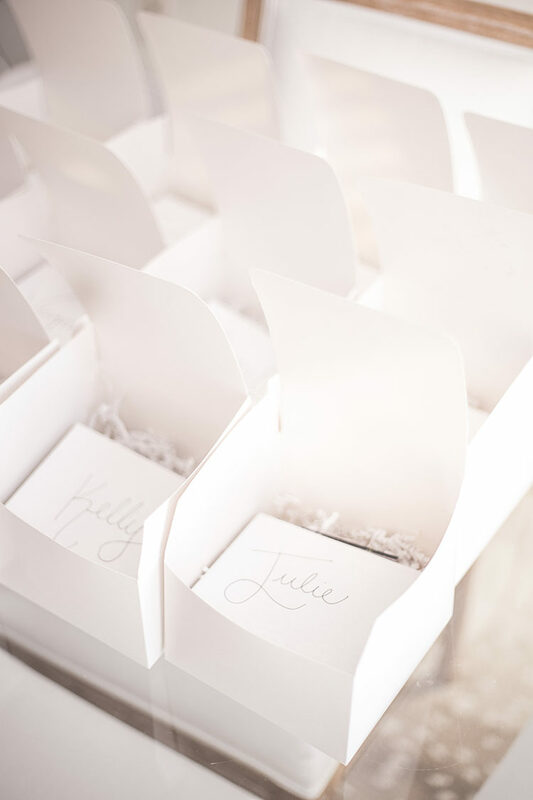 So if you find yourself trying to figure out how to ask your bridesmaids one of these days, take my advice and keep it simple and sentimental. You really can’t go wrong with that combination. And while we’re on that note, here are a few adorable ideas for items to achieve just that! 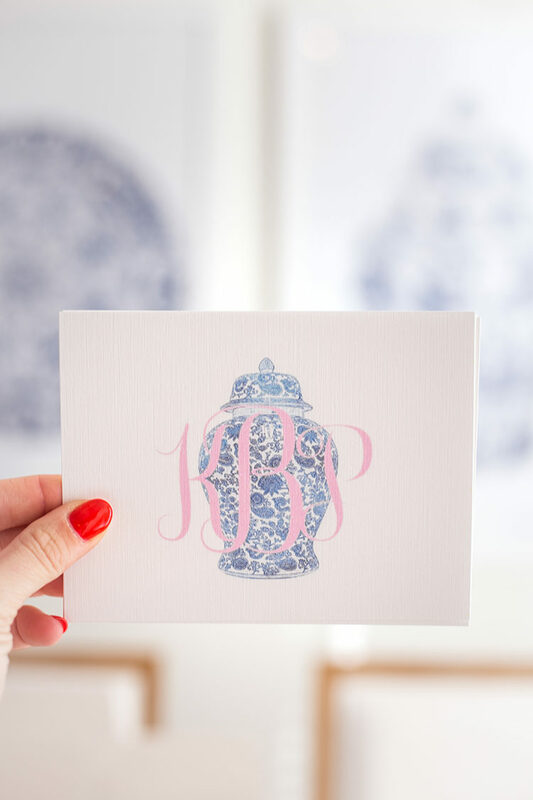 If you’ve done or received a “bridesmaid proposal,” I’d lvoe to hear your ideas below! This is such a sweet and thoughtful idea! I love receiving framed photos! I sent my girls a handwritten card as well along with champagne gummy bears. I was too nervous that in sending the mini bottles, they’d break. After our wedding I sent a handwritten letter thanking them along with one of the shots of us together! Love these frames! 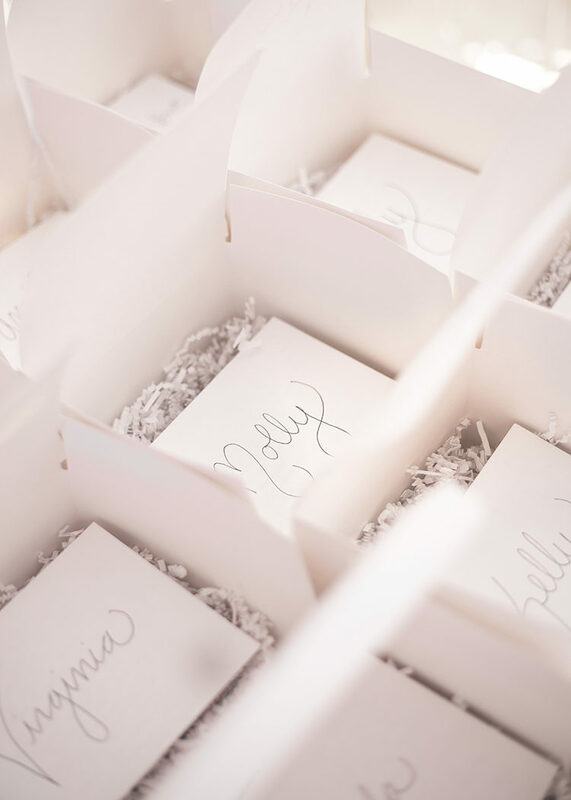 Thinking I need some around my house :) I just got married in October and I asked my girls by sending them a box of bath bombs and using the saying “It would be the bomb if you would be my bridesmaid!” Plus a handwritten note of course! 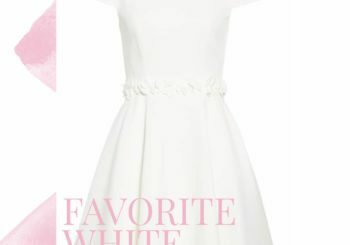 Ah this is so pretty! 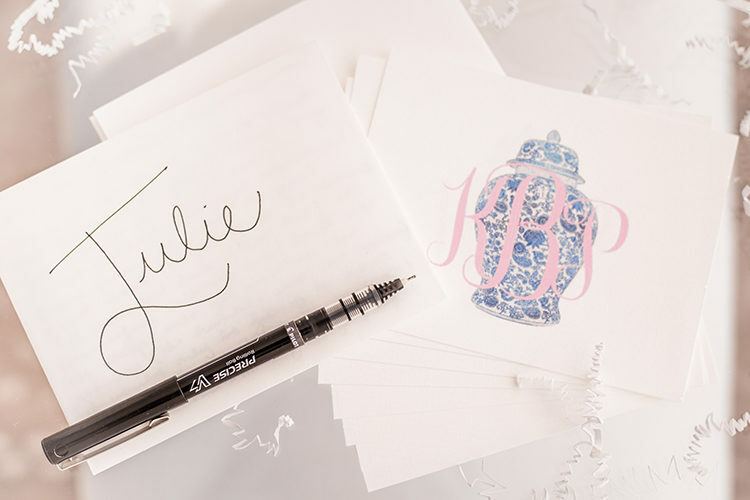 I love the personalized monogrammed stationary!! I also put together little baskets for my BM’s that i found at Michaels, filled with crinkle paper and spa day items bc my friends know i love selfcare – sheetmask, bath bombs, hair ties, nail file, and wedding theme candles from bath and body works! Love this! For your name did you drop your middle name? Or did you use your maiden last name? Super cute idea! I got married almost 4 years ago (WOW), and I luckily had a small bridal party of 3, all who lived in the same town as me. I ended up giving a “bridesmaid first aid kit” with a galvanized pail full of nail polish (my wedding colors), monogrammed pocket tissues, chocolate, mini champagne, and a nail kit/Band Aid kit, and an initial necklace. I agree that something sentimental is always a great place to start (hence, a necklace they all still wear) and you don’t have to go overboard with goodies. So so excited to hear Lorena our your big day! You’ll be so blessed the day of with all your best girlfriends by your side! o my goodness! Is that Virginia from Starfish Project in one of those pictures?! (i promise I’m not a stalker 😂) I had started following the Starfish Project because you highly recommended them a few years ago and I fell in love with their mission, but I never realized y’all were actually friends. LOL that’s so cool!